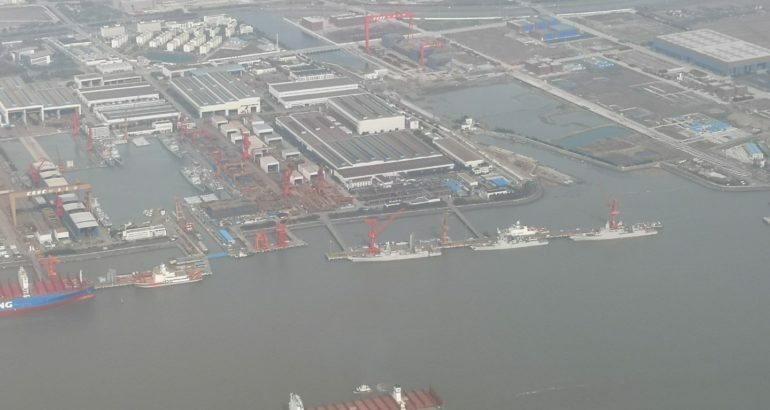 Recent aerial view of Jiangnan shipyard near Shanghai showing an impressive number of surface combatants under construction. 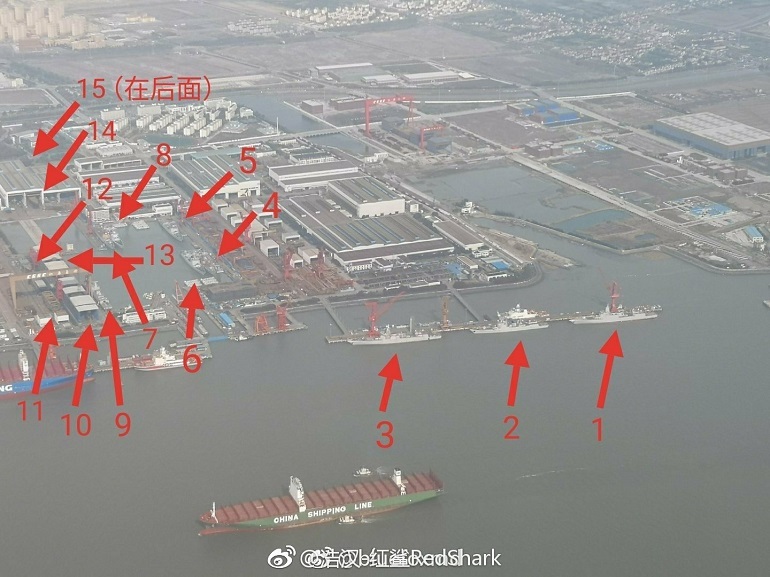 Recent aerial pictures of Jiangnan shipyard are doing the rounds on social media: They show no less than 15 destroyers and 1 aircraft carrier at various stage of construction. The Jiangnan Changxing Shipbuilding and Heavy Industry Corporation (Jiangnan-Changxing) shipyard is located North East of Shanghai, on Changsing island. The shipyard is a member of China State Shipbuilding Corporation (CSSC). The 15 destroyers are a mix of Type 052Ds and Type 055s, the two largest and most capable classes of surface combatants currently being built for the People’s Liberation Army Navy (PLAN or Chinese Navy). 23 Type 052 Destroyers are already operational with the PLAN or under construction. They are still under production by two shipyards: Jiangnan-Changxing shipyard and Dalian Shipbuilding Industry Company. The first vessel of the class, ‘Kunming’ (hull number 172), was commissioned in March 2014. The last one to be commissioned was “Hohhot” (hull number 161) in January this year. The Type 052D Destroyer displaces 7,500 tons, has a length of 157 meters, a beam of 17 meters and a crew complement of 280 sailors. At least eight Type 055 destroyers are under construction or fitting out. As for the Type 052D they are being built at the two shipyards: Jiangnan-Changxing and Dalian Shipbuilding Industry Company. First ship of the class, ‘Nanchang’ was launched in June 2017 in Shanghai and the second one was launched in April 2018 at the same shipyard. The Type 055 Destroyer has a length of 180 meters, a beam of 20 meters and a draft of 6.6 meters for a full load displacement of 13,000t. These destroyers are the largest surface combatant currently being built in the world: They are larger than the US Navy’s Ticonderoga-class cruiser and the Flight III Arleigh Burke-class destroyer (9,800 tons) or the Royal Navy Type 45 (about 8,500 tons). Their official PLAN designation is “10,000-ton class destroyer” while the US Department of Defense have been calling them “cruisers” since 2017. 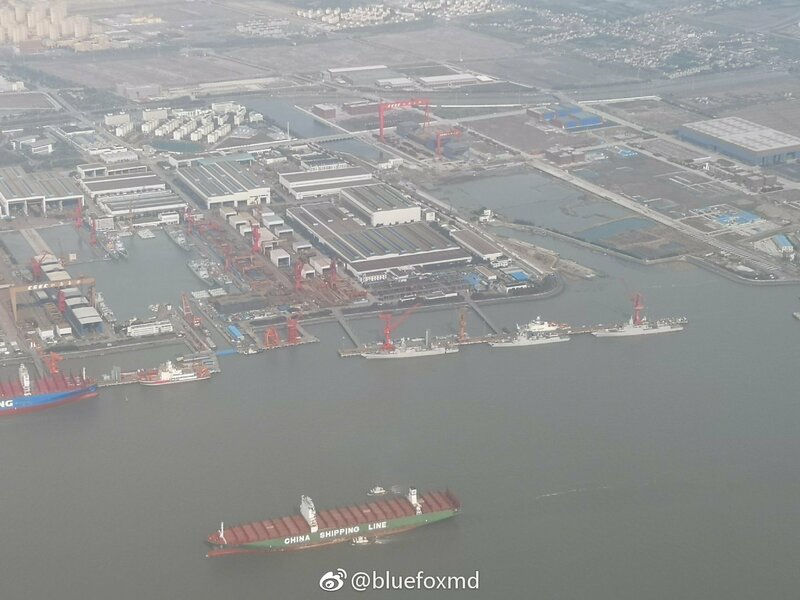 Last but not least, the area at the top right of the picture (where the large red cranes are located) reportedly shows the area where the PLAN’s third aircraft carrier (known as Type 003) is being constructed, with fairly large modules already in place.